Data Science refers to the collection, preparation, analysis, visualization, management and preservation of large collections of information. Firstly, it requires skill in the area of databases, computer science and mathematics. Secondly, it also requires non-mathematical skills such as organization, execution, communication and management. 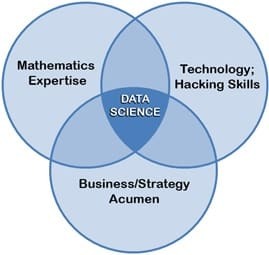 Hence we can broadly say that Data Science requires a person to be proficient in Mathematics, Technology(Computer Programming) and Business acumen. This is shown graphically by the figure in the right. What does Data Scientist do ? Data Scientist play active roles in the design and implementation work of four related areas: data architecture, data acquisition, data analysis and data archiving. The life of a Data Scientist revolves around data. When given a challenging question, they initiates with data exploration to identify the pattern within the data. Later they develop models based on the identified patterns and use them to predict these patterns from the new unseen data. Data scientist guides business stakeholders to takes decisions. They act as consultants by providing strategic guidance using data-driven insights. How Data Science is different from Data Analysis ? Data Analysis traditionally deals with inspecting, cleansing, transforming and modelling data. It has been and still being used to discover useful information, suggest conclusions, and support decision-making. It has numerous faces and approaches which results in variety of methods under diverse names, in variant domains such as science, social science and businesses. Data Analysis primarily focuses on the historic data and discovers relevant insights that can be useful to the business. These insights are more of a corrective suggestions which may or may not yield significant gain in business. Data Science is a new age term given to an interdisciplinary field of mathematics, programming and business understandings. Not only it encompasses Data Analysis by leaps and bounds by deriving relevant insights, it also pertains in apply then in real time decision making process. Hence a Data Scientist has to work and develop production grade systems that predicts the output based on the past historical trends observed in the data while a data analysis merely curates meaningful insights from data. What about Data Science at APLC ? Machine Learning and Advanced Algorithms.